Jacqui selected Robert Kaufman Metro Living Dot Black. In place of a zigzag stitch all the way around her fabric Jacqui used her serger. Jacqui suggests basting and gathering the edges to eliminate the fullness. A cord lock was used to keep her strings tight. Jacqui enjoys making clothes. 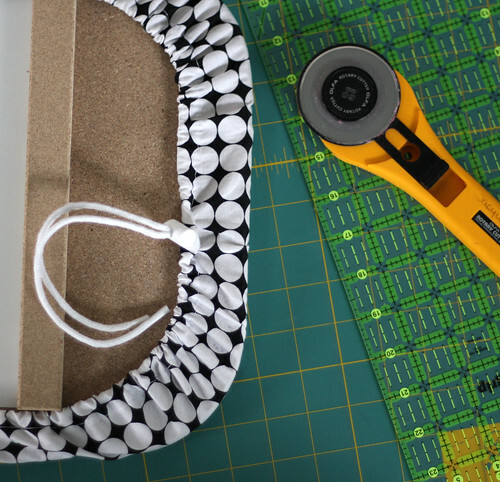 This little board is a handy tool in her sewing room. 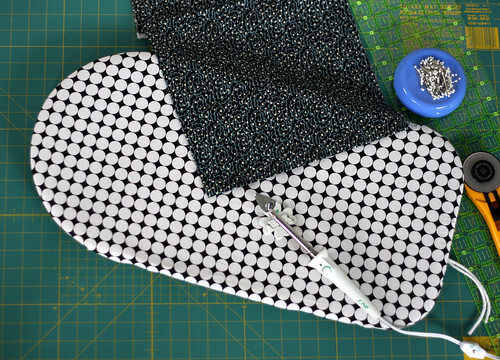 The Tabletop ironing-board cover is a fun project, simple to follow instructions and high impact in the charm department! Carrie selected Mo Bedell’s Party Dress Diamond Garden Shindig and Mo Bedell’s Party Dress Grandma’s Pearls Blue. She loves navy blue and turquoise. 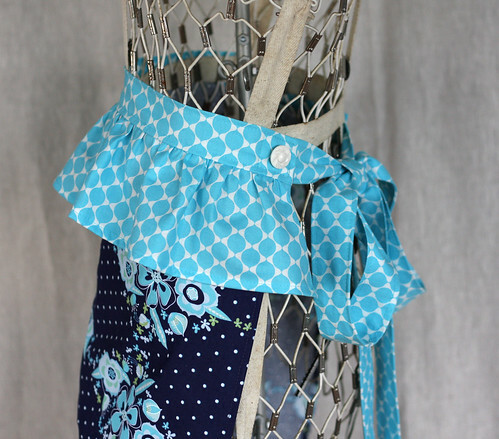 The apron will be a perfect match in her kitchen. Carrie ordered 3/4 yard of the Diamond Garden Shindig and a 1/2 yard of Grandma’s Pearls Blue. 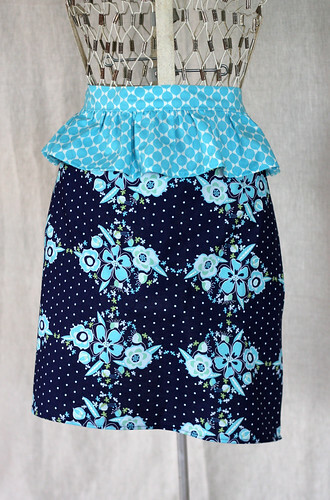 When cutting out the apron fabric she used a little extra fabric so the flowers would be centered on the apron. An all over print would not require fabric beyond 1 yard. She cut the ties at 41″ instead of the 31″ so she could wrap around the tie or have a generous bow. The pattern was easy to follow and went together quickly. The addition of Vintage buttons is a fun suggested detail. They look darling where the ties join the apron.